A common feature of almost all apps is the fact that they provide multiple view controllers to users to navigate and work with. Those view controllers can be used in many ways, such as to simply display some kind of information on-screen, or to gather complex data from user input. Creating new view controllers for different functionalities of an app is often mandatory, and several times a little bit daunting task. However, sometimes it’s possible to avoid creating new view controllers (and their respective scenes in storyboard) if you just make use of expandable tableviews. As the term suggests, an expandable tableview is a tableview that “allows” its cells to expand and collapse, showing and hiding that way other cells that in any other case would be always visible. Creating expandable tableviews is a nice alternative when it’s required to gather simple data, or to display on-demand information to users. With them, it’s not necessary to create new view controllers just to ask users for data that in any case should exist in one, default view controller. For example, with expandable cells you can show and hide options of a form that collects data without having to leave that view controller at all. Whether you should use an expandable tableview or not always depends on the nature of the app you develop. 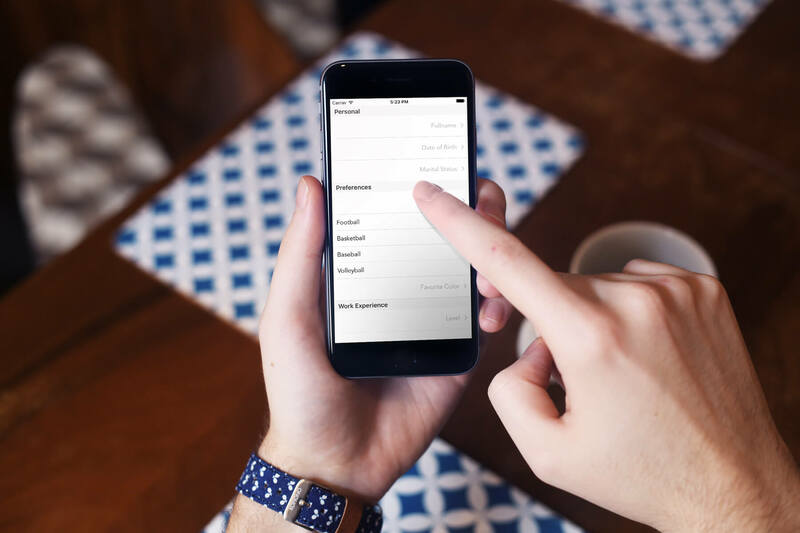 However, as the UI of the cells can be customized by subclassing the UITableViewCell class and creating extra xib files, the look and feel of the app should normally not be a problem. So, at the end, it’s just a matter of requirements. In this tutorial I’m going to show you a simple but efficient way to create expandable tableviews. Note that what you’ll see here does not consist of a unique method for implementing such a feature. Pretty much the implementation is based on the app needs, but my goal here is to present a quite general way that can be reused in most cases. So, by having said that, move to the next part to get a taste of what we’re about to deal with in this tutorial. Full name: It displays the full name of the user, and when it is expanded two sub-cells are available for typing the first and last name. Date of birth: It displays the date of birth of the user. When it’s expanded, a date picker view is provided for selecting a date, and a button to set it as the selected one to the respective top-level cell. Marital status: This cell displays whether the user is married or single. 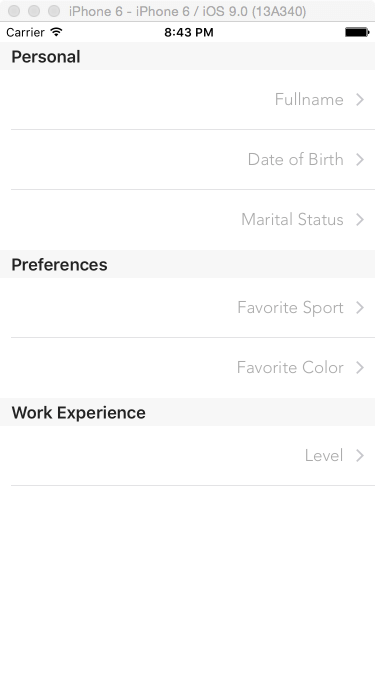 When expanded, a switch control is provided for setting the marital status. Favorite sport: Our fake form is supposed to ask for the favorite sport of the user, which is displayed here when selected. When this cell is expanded, four options with sport names become available, and when a sub-option is tapped the cell will “automatically” collapse. Favorite color: Pretty much same as above, this time though we’ll display three different colors to let the user select from. Level: When this top-level cell is tapped and expanded, another cell with a slider appears to let user specify a hypothetic work experience level. The allowed values are within the 0…10 range, and we’ll keep only integer values. Their names suggest what each cell is for, but you can get the starter project and explore deeper on your own. Besides the cells, you’ll also find some code already been implemented. Even though it’s important and completes the functionality of the demo app, that code does not consist of core part in this tutorial, so I just skip to go through it and provide it as already made. All the missing code we’re interested about in this tutorial will be added step by step as we move through the following parts. So, now you know what our final goal is, therefore we are ready to learn how to create an expandable tableview. 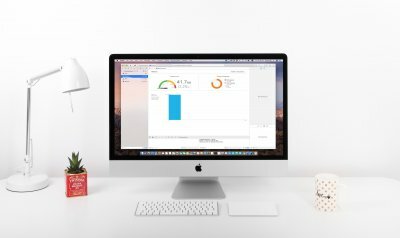 All the implementation and the techniques that I’m going to present in this tutorial regarding the expandable tableview lies to a single and simple idea: To describe the details of each cell to the app. That way is possible to let it know which cells are expandable or not, which are visible or not, what’s the value for the text label of each cell, and so on. Actually, the whole idea is based on grouping a bunch of properties that either describe attributes or contain certain values for each cell, and then making them available to the app so it properly displays them. isExpandable: It’s a bool value that indicates whether a cell can expand or not. It’s one of the most important properties for us in this tutorial. isExpanded: A bool value again, indicating whether an expandable cell is expanded or collapsed. The top-level cells will be collapsed by default, so initially this value will be set to NO for all of them. isVisible: As the name suggests, indicates whether a cell is visible or not. It’s going to play a significant role a little bit later, as we’ll be based on that property so we display the proper cells in the tableview. value: This property is useful for keeping the value of UI controls (for example, the value of the marital status switch control). Not all cells have such controls, so for most of them this property will remain empty. primaryTitle: It’s the text displayed in the main title label of the cells, and several times contains the actual value that should be displayed on a cell. secondaryTitle: It’s the text displayed either in the subtitle label of a cell, or in secondary labels. cellIdentifier: It’s the identifier of the custom cell matching to the current description. It won’t be used by the app just to dequeue the proper cell, but also to determine the proper actions that should be taken depending on the displayed cell, and to specify the height of each cell. additionalRows: It contains the total number of additional rows that should be displayed when an expandable cell is expanded. The above collection of properties will be used to describe each single cell that we’re about to have in the tableview. In app-level terms, we’re going to do that easily simply by making use of a property list (plist) file. In this plist file, we’ll properly fill the values of the above properties for all cells, and that way we’ll end up having a full technical description of them that can be used both from us and the app. And all that without writing a single line of code. Isn’t that great? First of all, the file you (hopefully) downloaded is called CellDescriptor.plist. The base structure (root) is an array, where each item in it represents a section in the tableview. That means that the base array in the plist file contains three items, as many as the sections we want to exist in the tableview are. Now it’s the best time to take your time and see a bit more thoroughly the properties and their values for all those cells that we’re going to display in the tableview. It’s easy to understand that by having that cell description at our disposal the required code we need to write for creating and managing expandable cells is significantly decreased, and that we won’t have to dictate the app about the various states of the cells (for example, which cells are expandable, whether it should allow the expansion of a specific cell or not, determine in code if a cell is visible or not, and so on). All that information exists in the property list file you just downloaded. It’s time finally to write some code, as even though we save a lot of it by using the cell description technique, there’s still code needed to be added to the project. Now that the cell description property list file exists, the first thing we must programmatically do is to load its contents into an array. That array will be used in the next part as the datasource for the tableview. 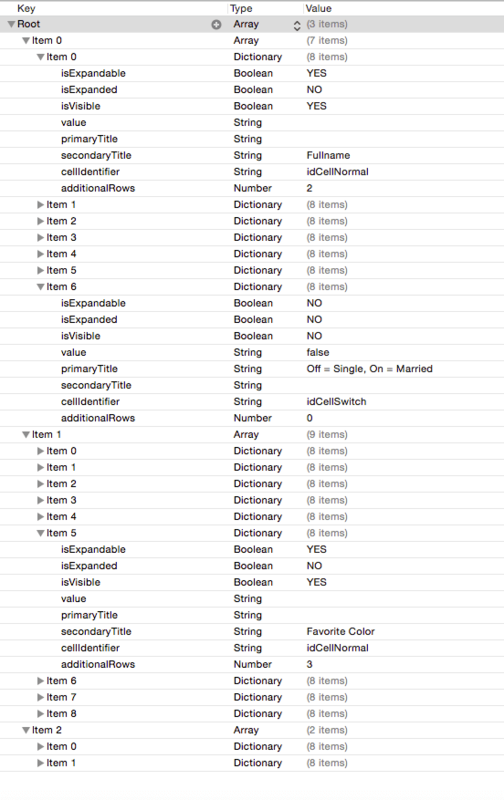 This array will contain all the cell description dictionaries that will be loaded from the property list file. What we do here is quite simple: We first make sure that the path to the property list file in the bundle is valid, and then we initialize the cellDescriptors array by loading the file contents. If you type the print(cellDescriptors) command right after the last line in the above snippet and run the app, you’ll see all the plist file contents getting listed in the console. That means that they’ve been successfully loaded in memory. Normally, our work in this section should finish now, but we won’t do that; we’ll make one more addition that will be proved vital in the next part. As you’ve found out so far (especially if you’ve examined the CellDescriptor.plist file), not all cells are going to be visible at app launch. Actually, we can’t just know if they’ll ever be visible all together simultaneously, because they can be expanded or collapsed as per user demand. In the programming world, that means that the row index of each cell cannot be constant (what we programmatically write as indexPath.row when handling cells), therefore we can’t just go through our datasource array using the cell row and display each cell. It’s mandatory to work that out and come up with a solution that will provide the row index of the visible cells only. Any attempt to display cells that have been marked in the description as not visible would lead to a faulty implementation, and of course, to abnormal app behavior. This two-dimensional array will store the index of the visible cells for each section (one dimension for the sections, one for the rows). Note that at the beginning it’s required to remove any previous contents from the visibleRowsPerSection array, otherwise we’ll end up having wrong data in it after subsequent calls of this function. Further than that, the implementation is straightforward, so I avoid commenting anything further. Even though the tableview isn’t working yet, we trigger a reload action in advance so we make sure that the proper cells will be displayed after launching the app. Knowing that the cell descriptions are loaded every time the app gets launched, we’re ready to proceed and display the cells in the tableview. We are going to begin in this part by creating another new function that will locate and return the proper cell descriptor from the cellDescriptors array. As you will see in the following code snippet, having populated data in the visibleRowsPerSection array is a prerequisite for this new function to work. The parameter that the above function accepts is the index path value (NSIndexPath) of the cell that is currently being processed by the tableview, and it returns a dictionary containing all the properties matching to that cell. The first task in its body is to find the index of the visible row that matches to the given index path, and that’s easy to do as all we need is the section and row of the cell. At the moment you don’t have the full picture as we haven’t dealt at all so far with the tableview delegate methods, so I must say in advance that the total number of rows per section will match to the number of visible cells in every section. That means that any indexPath.row value in the above implementation matches to the proper visible cell index in the visibleRowsPerSection. By having the index of the row for each cell, we can proceed and “extract” the cell description dictionary from the cellDescriptors array. Note that the value specified as the index of the second dimension of that array is the indexOfVisibleRow, and not the indexPath.row. Using the second would lead to return false data. You understand that we could not just overlook the case where the cellDescriptor array would be nil. We return the number of its sub-arrays if only it has been initialized and filled with the cell description values. There’s something that I’d like to underline here: For first time we make use of the getCellDescriptorForIndexPath: function that was implemented earlier in this part. We need to get the proper cell descriptor, because right next it’s necessary to fetch the “cellIdentifier” property, and depending on its value to specify the row height. You can verify the height values for each type of cell in the respective xib files (or just take them as granted as shown here). For normal cells, we just set the primaryTitle and secondaryTitle text values to the textLabel and detailTextLabel labels respectively. In our demo app, the cells with the idCellNormal identifier are actually the top-level cells that get expanded and collapsed. For cells containing a textfield, we just set the placeholder value that is specified by the primaryTitle property of the cell descriptor. Regarding the cell that contains a switch control, there are two things we do here: We firstly specify the displayed text before the switch (this is constant in our case and can be changed in the CellDescriptor.plist file), and then we set the proper state of the switch, depending on whether it’s been set as “on” or not in the descriptor. Note that later we’ll be able to change that value. 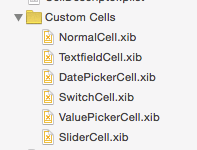 There are also the cells having the “idCellValuePicker” identifier. Those cells are meant to provide a list of options, and when an option is selected the parent cell will automatically collapse. The cell’s text label is specified in the case shown above. Lastly, there’s the case of the cell containing a slider. Here we just get the current value from the currentCellDescriptor dictionary, we convert it into a float number, and we assign it to the slider control so it shows the proper value all the time (when it’s visible). Later on we’ll change that value and we’ll update the respective cell descriptor. For the cells for which the identifiers wasn’t explicitly added as a case in the above statement there’s nothing to do in this demo app. However, if you want to handle them in a different way, feel free to modify the code and add any missing parts. 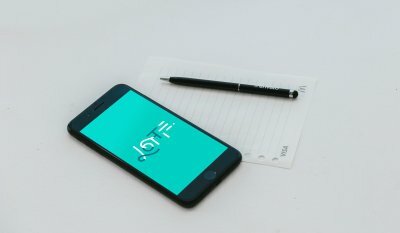 Now you can run the app and see some results for first time. Don’t expect to see much, as what you’ll get is the top-level cells. Don’t forget that we still haven’t enabled the expanding feature, so nothing will happen if you tap on them. However, don’t get discouraged, because what you’ll see means that what we’ve done so far it’s working perfectly. I assume that this part is probably what you’ve been expecting the most, as the actual goal of this tutorial will be achieved here. For first time we’ll manage to make our top-level cells expand and collapse every time they get tapped, and the proper sub-cells appear or hide on demand. Once the above flag gets its value and properly indicates whether the cell should expand or not, it’s our duty to save that value to the cell descriptors collection, or in other words, to update the cellDescriptors array. We want to update the “isExpanded” property of the selected cell, so it will behave correctly in subsequent tapping (to collapse if it’s expanded, and to expand if it’s collapsed). As you see I use an animated way to reload the section that the tapped cell belongs to, but you can change that if you don’t like the way it is. Go and try the app now. The top-level cells expand and collapse on subsequent tappings, and even though nothing happens yet when interacting with the sub-cells, the result looks quite impressive! From now on we can totally focus on handling the data input and user interaction with the controls of the sub-cells. We’ll begin doing so by implementing the logic that must be put in action when a cell with the “idCellValuePicker” identifier is tapped. In our demo app, those are the cells that list the favorite sports and colors in the “Preferences” section of the tableview. Even though I’ve mentioned about it already, I think that it would be a good idea to refresh our memory and say once again that when such a cell is tapped, we want the respective top-level cell to collapse (and hide the options), and the value shown to the selected cell to be displayed to the top-level cell as well. The actual reason for which I chose to start dealing with this type of cells is the fact that we’ll continue working in the tableview delegate function of the last part. In it, we’ll add an else clause to handle the case of non-expandable cells, and then we’ll check the identifier value of the tapped cell. If the identifier equals to the “idCellValuePicker” then we have a cell we actually interested in. We’ll find the row index of the top-level cell that is supposed to be the “parent” cell of the tapped one. In truth, we’ll perform a search towards the beginning of the cell descriptors and the first top-level cell that is spotted (the first cell that is expandable) is the one we want. We’ll set the displayed value of the selected cell as the text of the textLabel label of the top-level cell. We’ll mark the top-level cell as not expanded. We’ll mark all the sub-cells of the found top-level one as not visible. Once again we modify the “isVisible” property of certain cells, therefore the number of the visible rows gets changed. Obviously the call to the last two functions at the end is required. If you run the app now, you’ll see how the app reacts when selecting a favorite sport or color. In the CustomCell.swift file you can find the CustomCellDelegate protocol with all the required delegate methods already been declared. By implementing them in the ViewController class we’ll manage to make the app responding in all the other missing user actions. Once we specify the number of the proper section and row, we directly set the selected date as a string. Note that this string is a parameter in the delegate method. Lastly, there is the cell with the slider control under the “Work Experience” section that we have to take care of. When the user changes the slider value, we want two things to happen at the same time: To update the top-level cell’s text label with the new slider value (“experience level” in our app), and to store the slider’s value to the respective cell descriptor so it remains up to date even after having refreshed the tableview. The final missing piece of the puzzle was just added, so go ahead and give the app a last try. As I said in the beginning, creating expandable tableviews can be sometimes really helpful, as it saves you from the trouble to create new view controllers for app parts that could be handled in such kind of tableviews. In the previous parts of this tutorial I presented you an approach for making expandable tableviews where the main characteristic of it is the description of all cells using specific properties in a property list file (plist). I showed how you can handle this cell description list in code when displaying, expanding and selecting cells; additionally I gave you a way to directly update it with the data entered by the user. Even though a form like the fake one in our demo app could exist in a real app, there are still things needed to be done before it stands as a complete component (for example, save the cell description list back to file). However, that’s out of our goal here; what we initially wanted was to implement an expandable tableview with cells that appear or hide on demand, and that’s what we eventually did. I’d like to believe that you’ll find all the information in this tutorial useful. Definitely you’ll discover ways to improve the given code, or adapt it according to your needs. With that it’s time to leave you; have fun, and never stop experimenting! For reference, you can download the complete Xcode project at GitHub. Download link for plist is missing 🙂 Other than that, great tutorial, thanks! Red – thank you for posting this! Helped me out a bunch. Hi Gabriel. Thanks for a great and most helpful tutorial. This came at the right time for me and is just what I needed. I have one request/query. Is there a way to dismiss/hide the subrows with the picker/slider views when the user has made their selection? I guess similar to view.hidden = true in DidSelect method but this does not seem to work. If this can be implemented I assume you’ll add it in CustomCell.swift? It all seems to do with the NSMutableArray. What bugs me is that the demo runs without issues and I don’t have an idea how to fix this. Do you know of a way to fix this? Someone below posted a fix for this. Hello, thanks for this tutorial. However, i have some questions: why are the full name and last name input switching when hiding and re expanding the cells? How can i adjust them? And finally, how can i save the data entered by the user and use it? Thanks. I would like to know both these answers too. Possibly by creating another prototype cell with a submit button and having access to all the fields in that CustomCell.swift file? If I enter values into “full name” and tap full name to close it, then tap it again to open it again to make a change, last name and first name were flipped. What would be the potential cause for this? Has anyone found a solution for this? Mine has the same error. AWESOME tutorial. Thanks a bunch. When I touch to change slider value, slider will use strange animation. The thumbImage’s animation is bad but the application don’t crush. Sounds brilliant. Will I be able to do an Objective-C version of this tutorial? or is it mandatory to use Swift? Does it not look a bit strange when a user taps on an item like “Date of Birth” or “Favorite Color”, and the cell seems to kind of jump around upon expanding and collapsing? The first cells in the section behave properly, but any other cell seems to drift around and look distracting. I’m referring to the final product downloaded from GitHub. It does! Anybody have a fix for this? Yes. See my comments above. I whole heartedly agree. The reason this happens is because the whole section is being updated rather than just the expanded cell and newly visible cells. It’s a serious enough UI problem that I won’t use this approach unless I can find a solution. I am trying to find a way to only refresh / redraw the expanded cell, and the newly visible cells. No luck yet though. Anybody have any idea how to do this? Instead of using reloadSections you can use insertRowsAtIndexPath / removeRowsAtIndexPath. These two methods take an array of indexPaths, so to get it to work simply capture an array of the indexPaths that need to be inserted into the tableView. Importantly, your model needs to be updated before you insert/remove rows, so be sure to call getIndicesOfVisibleRows just before you call those methods. Results in a much smoother animation. Ryan, if you could post how you wrote the indexPath that you refer to that’d be reeally useful. Can’t seem to get either function working, insertRowsAtIndexPath nor deleteRowsAtIndexPath. // Step 1: get the index of the info in the main array that stores all the cells info. // step 2: get the row index to be inserted into the tableView. I get this by calling a little method that I set up that always returns the correct row to insert. // stpe 4: insert the rows. // step 5: make sure my record of visible cells is uptodate. Let’s give this a go still….in which case how have you defined the following Ryan? I believe the others are just simply renamed versions of the code above. Can you put this in your example project? Would be super cool to see. hi, Am fresher in swift.Can you just send me expandable tableview like favourite products in your example . Thanks for a great tutorial. May I suggest an improvement: using the refreshSection method causes some unpleasant animation if your section has many rows (since the whole section is being reloaded); it also causes a slight flicker of the section header for the same reason. Instead you could use insertRowsAtIndexPath and removeRowsAtIndexPath. All you need to make this work is an array of the indexPaths that you need to insert into the tableView that can be passed to those methods, and b) make sure your model is updated BEFORE you call those methods. End result: super smooth animation. 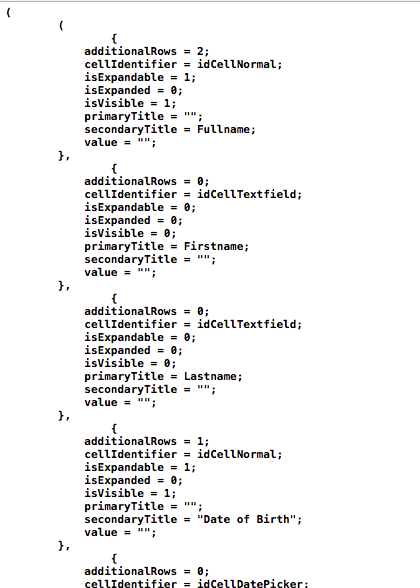 Would love to see how this code looks in practice…. Could you suggest me how to apply the multiple selection to this project? Thank you for the tutorial! Very cool! Is there any way to work around this error without having to add manually all the row in the cellDescriptor.plist ? Hi Morgan, did you figure that out? Sorry if this is a stupid question, but it seems this example does not actually store any of the user’s preferences choices that were made. So upon restarting the app, it always reverts to the original state. I like everything else and was thrilled to find this well-written tutorial, but it’s not terribly useful unless/until it can save the user’s preferences. But the new values don’t seem to “stick”. BTW, I have the same issue with the first name, last name switching around. Could you please give Objective-C version of this tutorial? any updates to swift 3? Add me to the list of folks that would appreciate a Swift 3 solution. I get the error “Type ‘Any’ has no subscript members” any and every time the cellDescriptors are called. (2.3->3.0) display when I attempt a run. I get “Build Succeeded” and no other alerts, but the simulator is blank. I’m REALLY new to programming, so any help would be greatly appreciated!